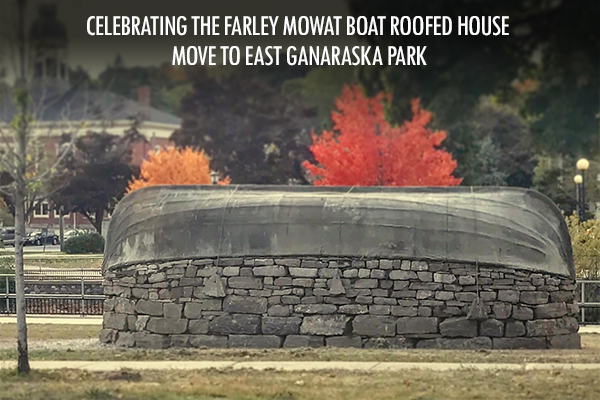 The Farley Mowat boat roofed house is currently located on private property at 20 Catherine Street in Port Hope, Ontario and is considered the largest monument dedicated to Farley Mowat in the world. Built ten years ago, this permanent structure will be ceremoniously dismantled and professionally reassembled at its new location in Eastside Ganaraska Park near the Public Library. The Municipality of Port Hope and the current owner boat house owner are in agreement as to the relocation where it will be enjoyed by visitors and residents for years to come. Continue to read more about "The Story So Far..."
Help relocate and celebrate this iconic structure. Boat Roofed House is on the move.